This season has been a slow one for Supernatural. 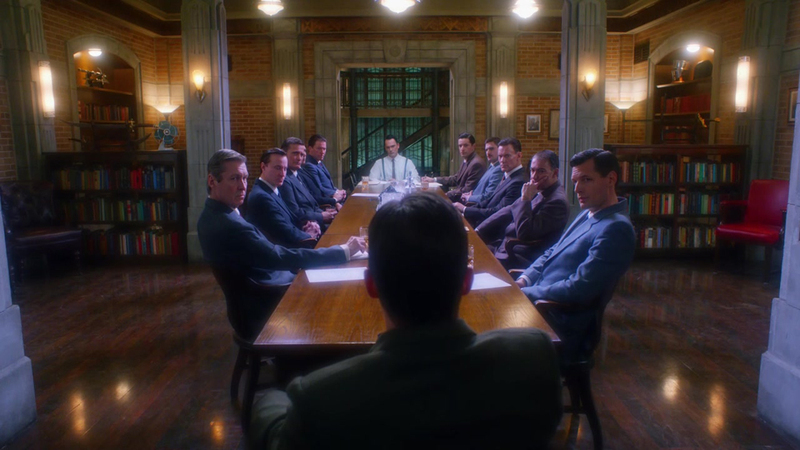 On a show where the forces of heaven and hell are at each other’s throats and the balance of power tends to shift so fast that you need to take notes to keep up, season ten has been decidedly, well, tranquil. Sure, there have been good episodes (“Fan Fiction” definitely makes the list of the show’s top ten episodes), and certainly there are issues hanging over the brothers and Castiel like the Sword of Damocles (the Mark of Cain, lost grace). But they’ve been hanging there so long that it was beginning to look as though the biggest obstacle the Winchesters had to overcome this season was their own whining. After all, Castiel has been substantially weakened, Crowley largely declawed, both heaven and hell are in working order, and neither can even be bothered to acknowledge the other’s existence. There’s been little to no real conflict. 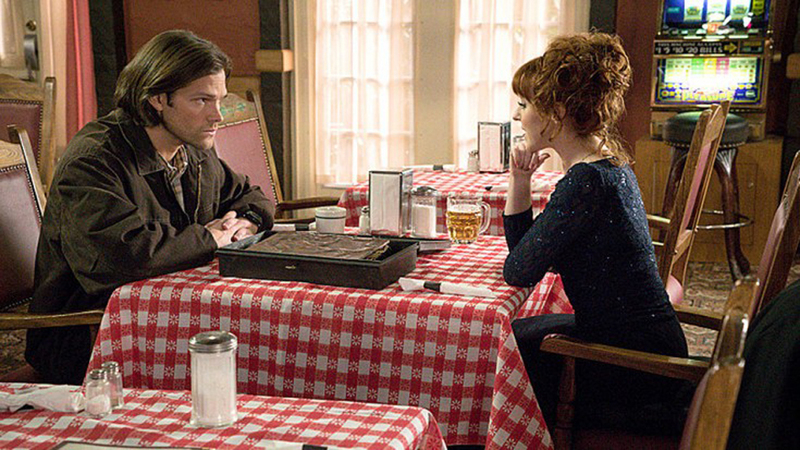 Earlier this season, Charlie (Felicia Day, who would be great as a series regular—hint, hint!) headed off to Europe in search of a tome that would lift the Mark from Dean, and now she’s returned, bringing with her a much needed upheaval in the Supernatural universe. The basic plot of the episode is not all that important: basically, that this book can cure Dean if properly decoded, and oh, yeah, there’s an evil family chasing Charlie to get their book back, but the boys quickly dispatch their A team, so that’s okay for now. What is important is how the players in this very long game get shuffled about and re-energized. Metatron, broken out of heaven by Winchesters and company, leads Castiel—both of them bitching and moaning the whole way—to his Grace. But of course the storyteller betrays the newly invigorated angel (hard to hold it against him considering Castiel has been promising to kill him for the whole trip) and makes tracks with the Demon Tablet. In the meantime, while Dean and Crowley maintain a somewhat friendly alliance, Sam pretends to destroy the Book of the Damned at his brother’s request (because it is calling the Mark in a way that bodes all kinds of evil), and instead takes the book to Rowena for help in decoding. Her price for this, we learn in the next episode, is that Sam kills Crowley. In other words, battle lines are finally being drawn up this season in typical Supernatural fashion: Castiel against Metatron, Metatron against anyone who doesn’t fancy him a god, Rowena against Crowley (or maybe not—could just be a set-up to turn the demon against the Winchesters), and that old perennial—the brothers against each other. It looks like things are about to get good. Unfortunately, rather than using that momentum, we instead get “The Werther Project.” In order for Rowena to decode the Book, you see, she needs the codex of an old adversary, Nadya. That codex just happens to have been secured by the Men of Letters, or rather one particular Man who has created a literal death trap around it. On its own, “The Werther Project” is a decent enough episode. The deadly Werther and the codex were secreted in the basement of a place belonging to the Men of Letters until Abaddon did away with them. In an Amityville-like twist, the house eventually came on the market and was bought by a family whose daughter Suzie (Erika-Shaye Gair, who also played the young Starbuck in Battlestar Galactica) inadvertently unleashes the hallucination and suicide-inducing trap that kills everyone but her. 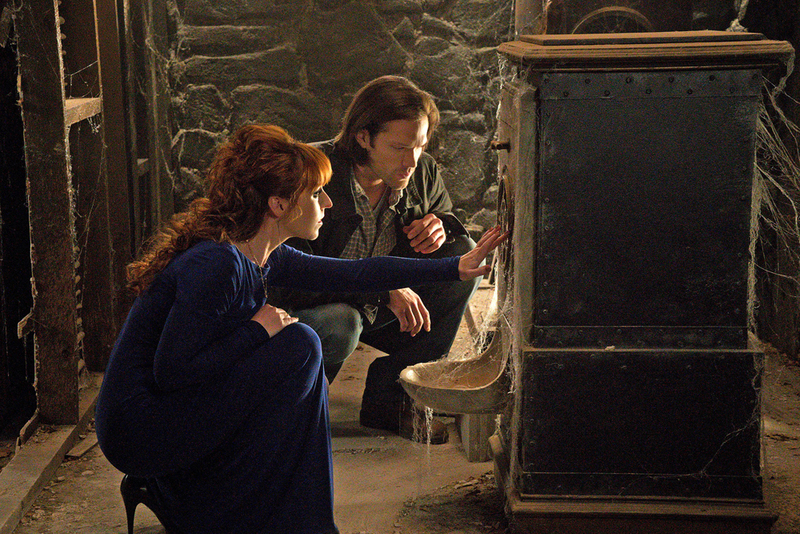 Sam, armed only with an incantation from Rowena and a vague idea of what the Werther is, visits the house, now guarded by a grown up and very bitter Suzie, to try to disarm the trap and bring the codex back to Rowena so she can decode the Book of the Dead. The problem with the episode is that, coming on the heels of “Book of the Damned,” it’s a bit of a let-down, straying back into the Winchester malaise which always boils down to “my brother or the rest of humanity?” and always seems to end up the same way: screw the rest of humanity. 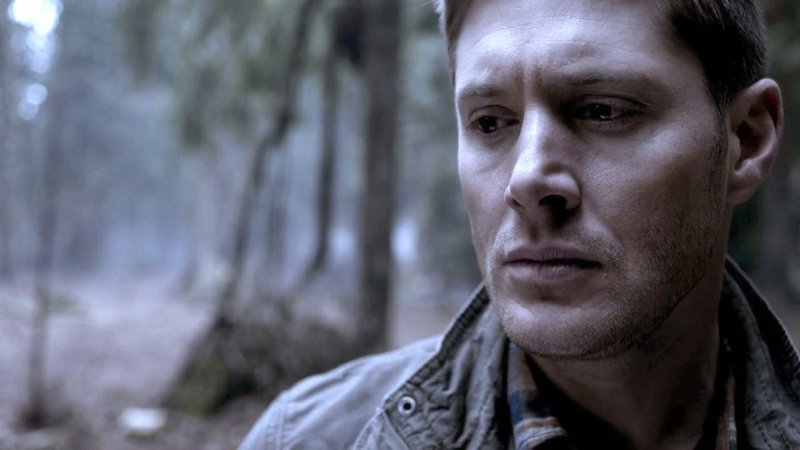 But while Sam’s experience with the suicide-trap is fairly run-of-the-mill, Dean’s is actually a bit more engaging because it takes us back to Purgatory, where Benny is waiting for us. Of course, it’s not really Purgatory, and it’s not really Benny, and in a smart move, the writer (Robert Berens) doesn’t have Dean buying it for a moment. This comes as such a relief; how many times have we seen a character who has enough experience to know better taking the better part of an episode to figure out something that should have been patently obvious from the start? Ah, well. The codex is now in Rowena’s hands. Rowena’s mad as a wet hen (Sam’s decision to chain her up may have been penny-wise and all that). Castiel is back in the game in a big way. And the boys are at odds over the Mark and, eventually, Crowley. 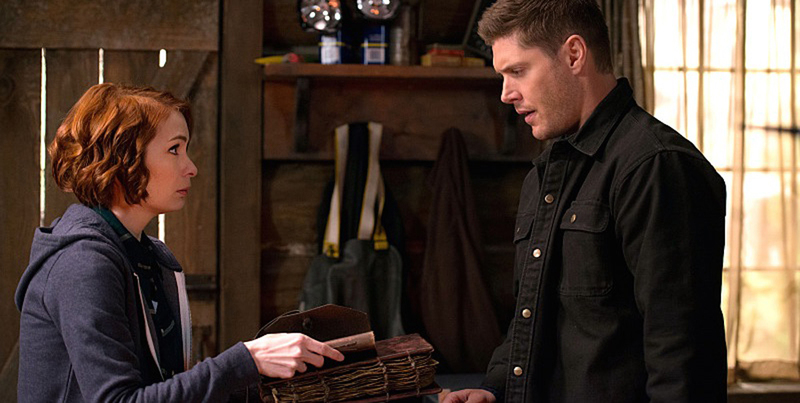 All is right—because it’s wrong—in the Supernatural universe. Hopefully the next few weeks will live up to the set-up we gotten in these last two outings.